Looks like we will be down there Monday the 29th for burning, the Yellow Pine Blowdown(golf course) and the helispot and some of the thinning piles near Johnson Creek airstrip and Cox Ranch. We hope to burn everyday next week until we finish the thinning piles along Johnson Creek. * Lower Johnson Thinning (95 acres): Is a project designed to reduce hazardous fuels within the WUI. This project is located approximately 7 miles south of Yellow Pine along NFS road 413 and Johnson Creek. * Yellow Pine Blowdown (40 acres): is located approximately 62 miles from Cascade, Idaho and is adjacent to the community of Yellow Pine. Hand Ignitions will be used to ignite machine piles along NFS roads 412, 413. The Cascade RD is planning to burn both the Lower Johnson Thinning and Yellow Pine Blow Down units this fall, both of these projects will be pile burning only NO Broadcast Burning is planned. The Lower Johnson Project (thinning & piling) was completed last summer, these handpiles are located along Johnson Creek road, Wapiti Ranch, Cox Ranch, Bryant Ranch/ Johnson Creek Airstrip. Hand Ignition for Lower Johnson should take about a week to complete, once those piles have been completed, the crews will relocate to Yellow Pine to burn the logging slash piles. If you have any addition questions please contact Tim Dulhanty tdulhanty@fs.fed.us (208-382-7400) or myself at 208-382-7400 or send me an email. This entry was posted in Fire Updates 2018, News 2018 on October 25, 2018 by The Yellow Pine Times. The Payette National Forest, Krassel Ranger District, is planning on implementing a prescribed burn on the south facing aspect between Deadman Creek and Reegan Creek along the East Fork of the South Fork of the Salmon River Oct 20-21. The edge of burn block E is about 5 miles west of Yellow Pine. See map below. For more information please call Justin Pappani at 208-634-0623 or Laurel Ingram at 208-634-0622. This entry was posted in Fire Updates 2018, News 2018 on October 18, 2018 by The Yellow Pine Times. There are NO fires currently threatening Yellow Pine. This will be the last fire update unless something flares up. In the last 3 days, Yellow Pine has received over 1/4″ of rain. Boise, Idaho. Sept. 26, 2018 — Southwest Idaho interagency fire managers anticipate favorable weather conditions for planned low-intensity prescribed burns this fall. Prescribed burns are designed to reduce hazardous vegetation (fuels), minimize wildfire potential near communities and improve wildlife habitat. Weather and fuel conditions permitting, prescribed burns are scheduled to start in October and continue through November. Approximately 2,600 acres are planned for controlled ignitions in 13 project areas within the Boise National Forest. Public and firefighter safety is always the first priority in all public land fire operations. Fire managers develop burn plans that consider: safety, specific fuel and weather prescriptions and smoke management. All prescribed burns are closely evaluated and are only approved when conditions are favorable. Fire officials strongly advise forest visitors and homeowners to prepare and plan activities around the proposed dates and locations of burns. Prescribed burns may impact individual’s that are sensitive to smoke. Recreationists should use extreme caution near prescribed fire areas and comply with closures. Access to areas immediately within or adjacent to burning operations may be temporarily restricted for public health and safety. Specific information and signage will be posted in advance of ignitions and remain in place until operations are completed. Please be cautious of firefighters and additional equipment within these areas as visibility will be decreased with smoke. The http://www.rxfire.com website is updated with information regarding southwest Idaho burns planned within Idaho Department of Lands, Bureau of Land Management, Payette National Forest and Boise National Forest. The Boise National Forest prescribed burn hotline: (208)-373-4208. * Alder Ridge (100 acres): located 1 mile north of Placerville, Idaho. This is a landscape burn (ground fire), using hand ignitions to reduce fuel in the wildland urban interface (WUI). * Amber (300 acres): located 2 miles east of Idaho City, Idaho. This is a modified tree well burn. * Buckskin (200): located approximately 3 miles east of Idaho City, Idaho. * Little Ophir (100 acres): located 4 miles west of Pioneerville, Idaho. A landscape burn using hand ignitions that will reduce fuel in the WUI. * Mores South-Granite Creek (250 acres): located 3 miles east of Idaho City, Idaho. This is a landscape burn (ground fire) using hand ignitions to reduce fuels in the WUI. * Horsethief (360 acres): located about 1 mile east/northeast of Horsethief Reservoir. This burn involves helicopter and hand ignitions to reduce fuels throughout the area that is within the WUI. * Westside Restoration Unit 39 (25 acres): This project is located on National Forest System (NFS) road 435 along West Mountain. It is approximately 10 miles west of Cascade, Idaho. This will be hand ignitions burn to reduce fuels within the WUI. * Crawford (100 acres): located approximately 4 miles east of Cascade, Idaho adjacent to the Crawford Guard Station, located off of NFS road 22, northeast of Davis reservoir; within WUI area. * Rainbow Point (19 acres): This project is located approximately 25 miles northwest of Cascade, Idaho. Machine Piles located within the Rainbow Point campground will be ignited by hand to reduce fuel accumulations throughout the campground. * Cottonwood II Rx (1000 acres): This project is located about 17 miles NE of Boise, Idaho along NFS roads 203 and 377 in the Cottonwood Creek drainage, north of Arrowrock Reservoir. * Miscellaneous Administrative Piles (1-2 acres): At Garden Valley work center. 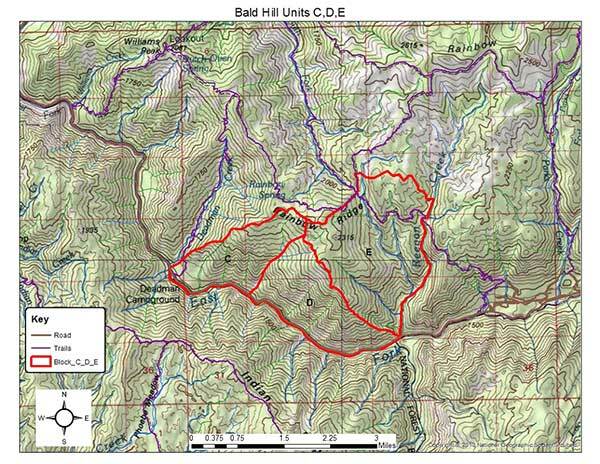 The Krassel Ranger District, Payette National Forest is planning to implement prescribed burns in the Bald Hill and Four Mile project areas this fall. In the Bald Hill Project area we will be working in areas of Reegan Creek and Deadman Creek from the East Fork road up to Rainbow Ridge. In the Fourmile Project area we will be working on both sides of the South Fork, between Blackmare and Holdover Creeks on the west side of the river and in the Fourmile Creek drainage on the east side. See attached map for more specific areas. Ignitions will likely take place in September or October, dependent on weather and fuel conditions. Primary ignitions will take 1-3 days for each burn block, with residual smoke and flame present until the next significant rain. Please do not hesitate to give a call or email with questions, my contact information is lenelson@fs.fed.us or desk phone is 208-634-0622. The Payette National Forest, Krassel Ranger District, is planning on implementing a prescribed burn on the south facing aspect between Deadman Creek and Reegan Creek along the East Fork of the South Fork of the Salmon River this fall. The edge of burn block E is about 5 miles west of Yellow Pine. See map below. Ignitions could occur over a period of 1-3 days in September or October 2018. 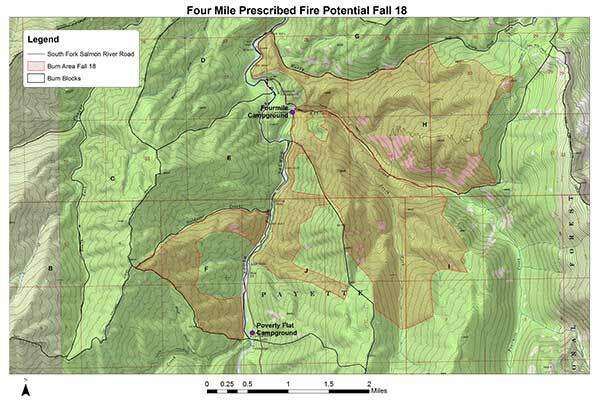 The Payette National Forest, Krassel Ranger District, is planning on implementing the Four Mile Prescribed fire project this fall. Ignitions may take place between Reed Ranch and Poverty Flat Camp Ground on both sides of the South Fork of the Salmon River. See map below. Ignitions could occur over a period of 2 or more days in September or October. No updates. Thermal map shows no new hot spots. Location The fire is located 7 miles southwest of the Village of Yellow Pine near Indian Point and has been moving east into the Caton Creek drainage. For public safety, the Indian Ridge Trail #090 has been close to public use due to hazards associated with Caton Fire. The entire trail is closed from its beginning at the junction of trial #291 Phoebe Meadows Trail, and the junction of trail #091 Caton Creek Trail. Location The fire is 3 miles southeast of the Pinnacles, near the West Fork of Monumental Creek Lakes. Thermal Map shows no new hot spots. Location one (1) mile northwest of Morgan Airstrip in the Frank Church River of No Return Wilderness on the Middle Fork Ranger District. A local Type III Incident Management Organization is managing the Prospect Fire located on Middle Fork Ranger District. The fire is burning in timber, brush, and tall grass, in the Frank Church River of No Return Wilderness in steep, inaccessible terrain. The fire is burning in the Prospect Creek and Morehead Creek drainages and has crossed to the east of the Middle Fork of the Salmon River towards Big Soldier Mountain. Fire activity is minimal as the fire area received precipitation. The fire is smoldering and creeping with an occasional single tree torching out. Fire resources are working to inform forest visitors in the area of the fire. The cause of the fire is undetermined. Forest Road 568 (the Boundary Creek Road) is closed at the Camp Tender Trailhead, which is approximately 3 miles north of the Junction of Forest Roads 579 and 568 at Bruce Meadows. Dagger Falls Campground, Boundary Creek Campground, and Boundary Creek Boat Launch are closed. These closures are necessary to provide protection to forest visitors from the current fire safety hazards associated with the Prospect Fire. Firefighters are implementing a point protection strategy. A point protection strategy is a wildfire response strategy, which protects specific assets or highly valued resources from the wildfire without directly halting the continued spread of the wildfire. The strategy takes in to account exposure to firefighters, values at risk, impacts to area user groups, and in the case of the Prospect Fire, wilderness values. The selected point protection strategy was determined to best balance for protection of values and firefighter safety. Values at risk in which work is in progress or completed is the administrative sites at Boundary Creek and the Morgan Ranch and Sulphur Creek Ranch properties. One outbuilding is confirmed lost. This entry was posted in Fire Updates 2018 on October 3, 2018 by The Yellow Pine Times. There are NO fires currently threatening Yellow Pine. We had some nice rain showers early this morning in Yellow Pine, 0.19″, enough to settle the dust. Rain total for the month of Sept 2018 = 0.26″. This fire was detected in heavy timber around noon on August 24 – a likely holdover from the lightning storm several days prior. The fire is located 7 miles southwest of Yellow Pine, near Indian Point. The Communities of Yellow Pine and Edwardsburg are not threatened by the fire. Fire activity for the past several days has been minimal with smoldering and backing fire to the west from Indian Point. Occasional tree torching has been observed. Indian Peak Trail (FS #090) has an emergency closure – please do not use this trail. No Area Closures have been implemented at this time. Firefighters are assigned to monitor the fire – additional fire resources will be assigned as needed. The fire is being managed under a confine/contain and point protection strategy. The fire has moved to the east in the Monumental Lakes area. The fire is 3 miles southeast of the Pinnacles, and within the area of the West Fork of Monumental Creek Lakes. Fire Management personnel monitoring the fire report that the fire is fairly inactive as of September 26. The size of the fire is approximately 5340 acres with a lot of unburned incorporated in the displayed perimeter. The majority of the fires perimeter has not grown for about a week. The fire area in the WF of Monumental creek is a mix of burned and unburned my guess right now at about 50% of each, with a couple smoldering spots high on the ridge on the north side of west fork monumental creek. The area continues to smolder with some interior cleanup. A low pressure system will bring showers and a few thunderstorms to the region today. Wind gusts up to 40 mph are possible near thunderstorms. Drier weather is expected for Monday with more showers possible for Tuesday and beyond. Location: west of the confluence of Pistol and Forty-Four Creeks in the Frank Church River of No Return Wilderness on the Middle Fork Ranger District. The Pistol Fire estimated at 426 acres is burning in grass, brush, and timber; west of the confluence of Pistol and Forty-Four Creeks in the Frank Church River of No Return Wilderness on the Middle Fork Ranger District. The fire is currently in monitor status. The cause of the fire is undetermined. Fire is in the Frank Church River of No Return Wilderness, Middle Fork Ranger District. One outbuilding is confirmed lost. Resources on the fire include, one (1) Type I crew, two (2) Type II crews, two (2)Type I helicopters, one (1) Type II helicopter, one (1) Type III helicopter, and one (1) Type 6 engine. A local Type III Incident Management Organization is managing the Prospect Fire located on Middle Fork Ranger District. The fire is burning in timber, brush, and tall grass, in the Frank Church River of No Return Wilderness in steep, inaccessible terrain. The fire is burning in the Prospect Creek and Morehead Creek drainages and has crossed to the east of the Middle Fork of the Salmon River towards Big Soldier Mountain. Fire activity moderated today with the cloud cover. Single tree and group torching was observed along with active runs when the winds and terrain aligned. The fire was active on the northwest of the fire with backing into the Boundary Creek drainage. Forest Road 568 (the Boundary Creek Road) is closed at the Camp Tender Trailhead, which is approximately 3 miles north of the Junction of Forest Roads 579 and 568 at Bruce Meadows. Dagger Falls Campground, Boundary Creek Campground, and Boundary Creek Boat Launch are closed. These closures are necessary to provide protection to forest visitors from the current fire safety hazards associated with the Prospect Fire. Weather: Dry conditions are expected to persist through most of today. Winds will be breezy today and, more so, on Sunday. Scattered showers will develop on Sunday ahead of an upper disturbance. Isolated thunderstorms cannot be ruled out. Expect ridgetops wind gusts of 20 to 25 mph with 13 to 28 percent humidity Saturday and gusts around 30 mph with 30 to 40 percent humidity on Sunday. Updates and information will be provided as significant changes occur. Visit the Salmon-Challis National Forest website: http://www.fs.usda.gov/main/scnf/home, and check out News & Events, ‘Like Us’ on https://www.facebook.com/salmonchallisnf, and ‘Follow Us’ on https://twitter.com/SalmonChallisNF for further information. This entry was posted in Fire Updates 2018 on September 30, 2018 by The Yellow Pine Times. It has been very dry and quite smoky in Yellow Pine the last several days. Looks like the Caton fire kicked up some yesterday, and the Prospect fire to the south is active. The Caton fire has been moderately active the past few days, with growth on the southwest corner of the fire. Its mostly backing and flanking fire on top of the ridge where the Indian Peak trail is. Attached is a map and photo taken from Miners Peak lookout on the afternoon of September 26th. Acreage on the Caton fire is approximately 800 acres. The Bum Creek fire was mostly inactive yesterday when we flew a recon flight. I have attached a map displaying the fires perimeter on September 26th. The size of the fire is approximately 5340 acres with a lot of unburned incorporated in the displayed perimeter. The majority of the fires perimeter has not grown for about a week. The portion of the Bum Creek fire area in the WF of Monumental creek is a mix of burned and unburned my guess right now at about 50% of each, with a couple smoldering spots high on the ridge on the north side of west fork monumental creek. The area continues to smolder with some interior cleanup of dead and downed fuels. High pressure in place Thursday – Saturday with clear skies and highs in the 60-70° range. Low pressure forecasted to move in Saturday night bringing slight chance of precipitation and a drop in daytime temperatures by 10 degrees through mid-week. The Central Idaho Dispatch Zone is at HIGH Fire Danger. The Pistol Fire was reported this afternoon at approximately 4:00 p.m. The fire is estimated at 150 acres and is burning in grass, brush, and timber; west of the confluence of Pistol and Forty-Four Creeks in the Frank Church River of No Return Wilderness on the Middle Fork Ranger District. The fire is currently in monitor status. The cause of the fire is undetermined. The Prospect Fire was reported on September 25th at approximately 4:00 pm. The fire is currently estimated at 560 acres, burning in timber, approximately one (1) mile northwest of Morgan Airstrip in the Frank Church River of No Return Wilderness on the Middle Fork Ranger District in steep, inaccessible terrain. The fire is actively burning in the Prospect Creek and Morehead Creek drainages. There are eight (8) firefighters and two helicopters assigned to the fire. An additional 12 firefighters are on order and will be on scene on Saturday morning. The cause of the fire is undetermined. Firefighters are implementing a point protection strategy. A point protection strategy is a wildfire response strategy, which protects specific assets or highly valued resources from the wildfire without directly halting the continued spread of the wildfire. The strategy takes in to account exposure to firefighters, values at risk, impacts to area user groups, and in the case of the Prospect Fire, wilderness values. The selected point protection strategy was determined to best balance for protection of values and firefighter safety. Weather: Dry conditions are expected to persist through Saturday. Winds will be breezy today and back off slightly Friday before becoming breezy again Saturday and more so on Sunday. Scattered showers will develop on Sunday ahead of an upper disturbance. Isolated thunderstorms cannot be ruled out. Ridgetops may see wind gusts to 30 mph on Sunday. Statewide, Idaho – As the weather starts to cool and leaves turn golden brown, many Idaho residents are getting ready for hunting season. Whether you’re target shooting or building your family’s traditional hunting camp, fire managers urge Idahoans to shoot responsibly and to be vigilant about taking precautions to prevent wildland fires. On May 10, 2018, acting BLM Idaho State Director Peter J. Ditton issued a Fire Prevention Order prohibiting the possession or use of steel core, incendiary, and/or tracer ammunition as well as exploding targets while shooting. Be proactive and take precautionary measures by clearing all flammable materials and rocks away from the target shooting area and having fire safety equipment (shovel, fire extinguisher and/or water) on hand. Studies have shown that sparks from steel core/steel jacketed fragments cause vegetation fires as often as lead core/copper jacketed and solid copper jackets fragments. Before you head out to your favorite hunting spot, make sure your vehicle and trailers are properly maintained by ensuring the safety chain is not dragging, wheel bearings are well greased, and tires are inflated to the proper level to help prevent a blown tire. Sparks thrown from an improperly maintained vehicle or trailer can cause roadside fires without the knowledge of the driver. Finally, everyone enjoys a campfire, but the devastating effects of an escaped campfire when left unattended could last for many years. Please take the proper steps to completely extinguish your campfire and any warming fires before leaving the area. For more information on current area wildfires and fire prevention information visit http://www.idahofireinfo.com, Idaho Fire Info on Facebook, and follow @BLMIdahoFire on Twitter. A total of 73 large wildfires have burned approximately 1,002,970 acres. Two large fires were reported today. Emergency responders and support personnel continue to assist with relief efforts in North Carolina. Weather: The off shore, easterly wind event across Oregon and northern California will begin to weaken as a strong, fast-moving cold front drops south from British Columbia into Washington and the Northern Rockies. The prefrontal flow will become westerly by afternoon. Elsewhere, a flat westerly flow will continue across the remainder of the country. A departing cold front will bring widespread showers to New England, and a dissipating stationary front will allow for scattered showers and storms to develop along the Gulf Coast. This entry was posted in Fire Updates 2018 on September 28, 2018 by The Yellow Pine Times. Dry, dusty and smoky here in Yellow Pine. Smoke is probably from the Bum Creek Fire. No fire restrictions, please be very careful with fire. The fire has shown low to moderate activity, with some growth in the past week or so, and active in the interior. We do not have any trail or area closures at this point, but if activity picks up, we may have restrictions on the West Fork Monumental Trail or Cougar Basin. For now, we have signs going up at the Lick Creek trailhead notifying Wilderness visitors that there is natural fire in the area and to make appropriate precautions. The lightning caused Kiwah Fire, was detected at approximately 5:30 p.m. on July 17, 2018. Fire managers estimate size at 14,603 acres. The fire is burning in a mixed conifer forest on the Middle Fork Ranger District and is being allowed to play, as nearly as possible, its natural ecological role in the environment while providing for firefighter and public safety. The fire is located in steep, inaccessible terrain northwest of Indian Creek Guard Station within the Indian Creek drainage in the Frank Church River of No Return Wilderness. Fire activity remains minimal throughout the fire area. Fire managers expect the Kiwah Fire will continue to burn until a significant precipitation event occurs. Typically, season-ending weather events occur in this area between the last half of September through the first half of October. The dry northwesterly flow pattern continues today through Friday. The rate of warming will increase, 6 to 8 degrees today and another 2 to 6 degrees Thursday. Winds remain light. Showers or thunderstorms are not expected before late Saturday night or Sunday. Nationally, there were no new large fires reported or contained. Only a handful of fires reported any acreage gains. Firefighters continue to work toward their containment goals. Weather: A secondary, more compact upper level trough will move into south-central Canada, pushing a back door cold front across the northern Great Plains into the Northern Rockies. Scattered showers will be possible along the Continental Divide as far south as north-central Wyoming. Offshore wind flow will continue along the West Coast as the thermal trough remains positioned just offshore. In the East, a passing cold front will bring widespread showers to all states along the Atlantic and Gulf Coasts. This entry was posted in Fire Updates 2018 on September 26, 2018 by The Yellow Pine Times. We had 0.04″ of rain this morning, not quite enough to settle the dust, but the air quality is much better. BOISE, Idaho – With cooler temperatures lowering the threat of wildfires, state and federal land management agencies will lift Stage 1 Fire Restrictions on all lands within southwest Idaho effective Sept. 21, 2018 beginning at 12:01 a.m.
* All state, private and BLM lands east of the Snake River, north and west of Highway 95 to the Little Weiser River, and north of the Little Weiser River to the Payette NF boundary. The boundary then follows the Payette NF boundary back to the Snake River. * All of Ada, Canyon, Gem, Payette and Washington counties. Portions of Boise County including the administrative boundary of Lucky Peak Lake to Arrowrock Dam, south shore of Arrowrock Reservoir and that portion of Elmore County that lies south of the South Fork Boise River to Anderson Ranch Dam, south along Anderson Dam Road (FS Rd 134) to Highway 20, east on Highway 20 to the Elmore/Gooding County line south to Interstate 84. The Treasure Valley Restriction area is bounded by the Idaho/Oregon boundary to Oreana then follows the Bachman Grade to Triangle and continues east-northeast of the Owyhee Front to the Bruneau River. The northern boundary begins near Weiser, Idaho and follows Highway 95 to Indian Valley, then generally follows the Little Weiser River to the Payette and Boise National Forest boundary lines. * Boise National Forest, Boise District BLM and State and Endowment Lands within Elmore County, Boise County, and Valley County to include all Bureau of Reclamation lands surrounding Lake Cascade. From the point where the Boise National Forest boundary intersects State Highway 20 near Dixie following the Boise National Forest boundary west and north along the ridge of the Danskin to Boise Front foothills and extending north encompassing the Idaho Department of Lands to its intersection back with the Boise National Forest boundary near Sage Hen Reservoir. The far northern boundary includes all Boise National Forest lands, excluding the Frank Church River of No Return Wilderness. All lands north of Sage Hen Reservoir including Tripod Mountain and West Mountain within the North Fork Payette River drainage north to near Tamarack Resort. * All of Owyhee County west of the Bruneau Canyon. Fire managers are asking the public to continue to be extra cautious when spending time in the outdoors. As a reminder, fireworks are prohibited on state and private forestland and rangeland during closed fire season (May 10 through Oct. 20), and on public lands, roads and trails in Idaho all times of the year. The Bum Creek Fire was detected on September 7, 2018. It is a lightning caused fire burning in the Frank Church River of No Return Wilderness. The Communities of Yellow Pine and Edwardsburg are not threatened by the fire. The fire is under a monitor status, and is being allowed to play its natural role on the landscape, enhance and maintain wilderness character, and help restore ecological process in this forested ecosystem. Fire activity has been moderate for the past few days, and putting up smoke that can be seen by backcountry travelers. The fire has grown approximately 350 acres from when it was mapped two days ago (Bum Creek Fire Map, September 20, 2018), and is established in the West Fork Monumental Lakes area at the head of the West Fork of Monumental Creek – burning in this area has been low to moderate intensity with about a 50/50 mix of burned and unburned vegetation. The fire is in the head of Cane Creek just outside the wilderness boundary – the fire is low intensity in this area and Management Action Points have been established to be implemented should the fire continue to burn outside the wilderness boundary. The Shell Fire was reported yesterday [9-21] evening at approximately 7pm. The fire is located in the Frank Church River of No Return Wilderness on the Middle Fork Ranger District. 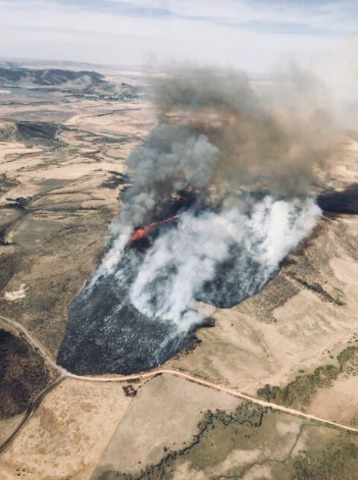 The fire is approximately three (3) miles southwest of Falconberry Guard Station and approximately one and a half (1.5) miles south, southeast of Indian Springs Cabin. Fire size is approximately one (1) acre with spot fires outside of the main fire perimeter and is burning in heavy timber. The fire is located in the the bottom of the drainage. Fire managers are currently monitoring the fire. There will be resources on the ground today informing forest visitors in the area of the fire. Fire cause is undetermined. Fire activity today was minimal. Firefighters continue to monitor the fire area. The Corral Creek, Iron Creek, and Moyer Creek areas are still showing smoke. Rehabilitation work continues as does backhaul of equipment no longer needed to meet the objectives of the fire. Due to the excellent work of firefighters on the Rabbit Foot Fire, the forest is going to transition to a smaller Type IV organization tomorrow morning. The Type IV organization shadowed the Type III organization today. The area closure changed today to a road closure. Please see Inciweb for the order and associated map. The Square Fire was reported this afternoon, September 20. The fire is located 1/2 mile into Idaho, from the Montana/Idaho border, in the Frank Church River of No Return Wilderness on the North Fork Ranger District. The fire is in the upper reaches of Bronco Creek, near Square Top Mountain. Fire is approximately one (1) acre in size burning in grass and brush with a heavy dead and down timber component in an old burn scar. The fire is currently in monitor status. The cause of the fire is undetermined. The BLM is responding to multiple Idaho fires. The 8 Mile Fire has burned 1,000 acres about five miles south of Soda Springs. The BLM says the fire is running in grass, shrubs, and timber. County officials are evacuating the areas north of the fire and say over 75 residences are threatened. Structures are threatened but at this time no evacuations have been announced. Firefighters contained 10 large fires yesterday. Two new ones were reported, one each in Montana and Oregon. Currently 71 large fires have burned 913,394 acres in 11 states. Weather: A westerly flow will resume across much of the country as temperatures remain near average in most areas. Breezy conditions are expected near the mountain passes in the mountains across the northern tier of the country. Showers will develop in the Cascades by afternoon and spread east into the Okanogan by evening. A stationary front positioned across the South will allow for a return to wet conditions across Texas, Louisiana, Mississippi, and Tennessee. All in all, widespread critical fire weather conditions are not expected today across the country. This entry was posted in Fire Updates 2018 on September 23, 2018 by The Yellow Pine Times.